We define complex stenoses as those which are tiered, long, sub-glottic, or associated with a fistula, tracheostomy or tracheomalacia. 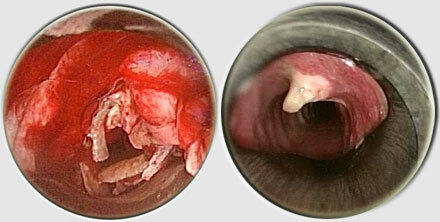 Tracheal necrosis with loss of cartilaginous support is also included. Necrotic cartilage should be resected, if need be in multiple sessions. In any case, tracheal wall support with a stent is often necessary.